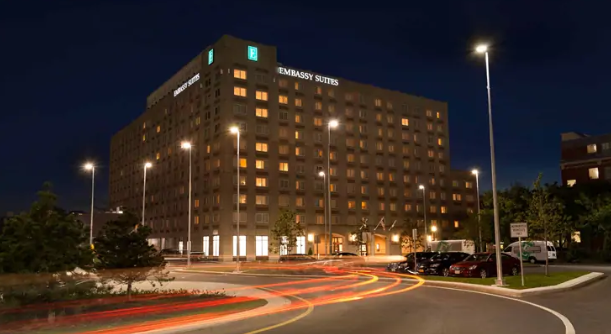 From smartly-appointed conferences to chic Boston weddings, Embassy Suites Boston at Logan Airport has your event needs covered with 4,745 sq. ft. of meeting space. For large receptions up to 200 guests or a special Quinceañera celebration, consider the Mystic Ballroom and review our catering options. For more intimate events, our lobby level function spaces are the perfect options. For our corporate meeting planner all our meeting space is conveniently located on the first floor accommodating up to 300 people theater style, plus separate break out rooms. Our open atrium and pre function area is perfect for exhibit or reception space. For smaller needs we have thirteen Executive Suites that can be used for overnight accommodations and board meetings, and of course we have an executive boardroom that can accommodate up to 10 people which is perfect for interviews and depositions.